(TibetanReview.net, Aug05, 2016) – After claiming that one of the world’s largest Buddhist study centres located in the Tibetan county of Serta (Chinese: Seda) in Karze (Ganzi or Garze) Prefecture, Sichuan Province, was only being renovated, China is now preventing news and information about the massive ongoing destruction there from being sent out by closely monitoring telephonic and online traffics, reported the Tibetan Service of Radio Free Asia (Washington) Aug 3. “No one is allowed to go near the areas being destroyed or to take photos or video of the demolition activities going on there,” the report quoted a local source as saying. The source has added that phones and social media were being closely watched by the authorities. The restrictions are said to be designed to block all reporting on the scope of the destruction taking place at the Larung Gar Buddhist Academy, with the authorities actively searching for anyone who may have already sent images of levelled dwellings and other structures to outside contacts. The demolition, said to have been ordered from Beijing with President Xi Jinping taking a special interest in it, was begun on Jul 20 and will continue into next year and possibly beyond. 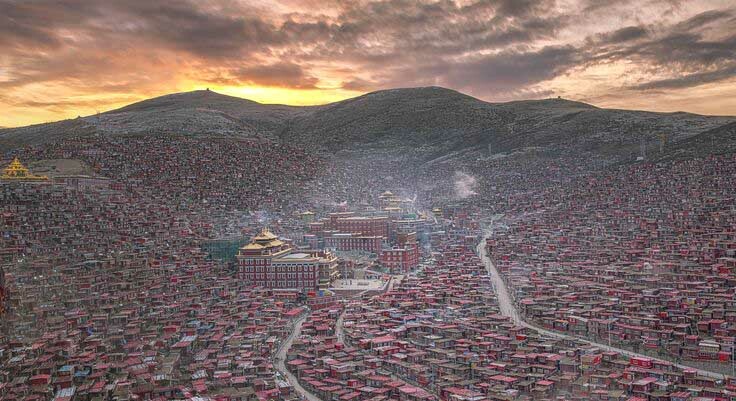 The goal is to reduce the number of Larung Gar’s residents, made up of both Tibetans and Chinese, besides people from other countries, by about half to a maximum level of 5,000 monk and nuns.